The G.I. Diet books can be purchased in major bookstores nationwide and online at Amazon.ca. The G.I. Diet has become the most successful Canadian diet and health book ever with more than 2 million copies sold in 23 countries in 17 languages. The best-selling G.I. Diet has again been revised and updated, and most importantly, contains a whole new section featuring a guide to how your personality type affects your eating behaviours. Whether you are impulsive, indecisive, long for control or feel helpless, you will be able to identify your traits and modify your eating habits. Available through all major bookstores and www.amazon.ca. The latest book in the G.I. Diet series is the G.I. 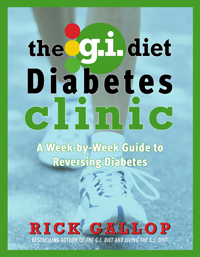 Diet Diabetes Clinic, a week by week guide to reversing diabetes. Based on a 13 week e-clinic conducted with 37 type II diabetics or pre- diabetics, The G.I. Diet Diabetes Clinic chronicles their experiences. The outcomes were remarkable with an overall reduction in blood sugar levels [A1C] of 15% and 75% of those medications were able to reduce their dosage. Everyone lost weight and inches, an average of 12.5 pounds and three inches from their waistline. All this in just 13 short weeks. If you are a type II diabetic or have been diagnosed as pre-diabetic [nearly one in three Canadian adults falls into this category], then of this week-by-week guide to reversing diabetes is for you. The second book in the highly successful G.I. Diet Clinic series addresses one of the most stressful times in a woman's life, Menopause. Menopause and post- menopause can be a challenging time of life for women. It is a time of not only physical change, but also empty nests and aging parents. Metabolism slows and hormonal storms play havoc with daily lives. Many are at the peak of demanding careers, which only adds to the stress. It's also the time of life when women begin to develop the dreaded middle-aged spread. In fact menopause is THE major hormonal trigger for women gaining weight. But there is a way to take control, a way to increase energy, reduce hot flashes and other menopausal symptoms and get rid of those hard-to-lose pounds. In The G.I. 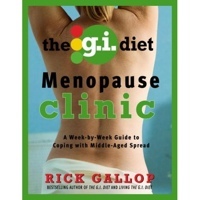 Diet Menopause Clinic Rick Gallop has adapted his hugely popular G.I. Diet specifically for the special needs of menopausal women. Rick addresses concerns such as middle age spread and the changing body shape; weight gain; lack of energy; mood swings; sleeplessness; hot flashes and low self esteem. The book is based on the experiences of a group of forty menopausal or postmenopausal women who volunteered to participate in a thirteen-week G.I. Diet Menopausal e- clinic. During these weeks, Rick acted as a personal coach, instructing the participants on the basics of the G.I. Diet, answering questions, providing tips on shopping, cooking, eating out, and dealing with cravings and emotional binge-eating. In turn, they shared their stories with Rick - what was working, what wasn't; their feelings, their highs and lows, stumbling blocks and ultimately their triumphs. The feedback from these participants was more than positive. They all lost weight and reported a significant decrease in menopausal symptoms such as hot flashes, tiredness, mood-swings and binge eating. Real-life advice, and support and encouragement from the experiences and inspiring stories from the women who walked the walk in the e-clinic. The G.I. 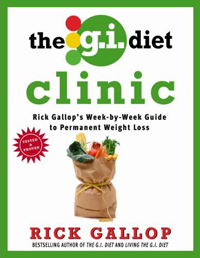 Diet Clinic is a 13 week weight loss program incorporating weekly meal plans and recipes to make losing weight on the G.I. Diet even easier. The Clinic is based on an actual E-Clinic which Rick undertook with volunteers with substantial weight problems. Every single one of the participants who completed the program lost a significant amount of weight, averaging a remarkable 25 pounds and an amazing 10 inches from waist and hips. As a reader of the G.I. Diet, you may find this book an ideal way to reinvigorate your weight loss program or introduce a family member or friend to the green-light lifestyle. Available in most bookstores and Amazon.ca. The G.I. 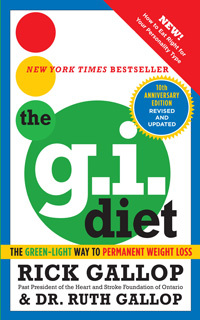 Diet Cookbook offers a plethora of tempting recipes to add to your G.I. repertoire. With two hundred nutritious, low-G.I. recipes for breakfasts, lunches, snacks, appetizers, dinners and desserts, you'll lose weight effortlessly as you indulge in delicious food. There are simple-to-prepare dishes for weekday meals, simmers and roasts for leisurely weekends, and elegant fare for entertaining friends. Through the week, enjoy Crunchy Granola for breakfast, Creamy Seafood Chowder for lunch, a slice of Strawberry Tea Bread for a snack, Spinach-Stuffed Chicken Breasts for dinner and Chocolate Pudding for dessert. Throwing a dinner party? Serve appetizers of Spinach Bites and Baba Ghanoush with Basmati Rice Crackers, a first course of Mushroom Soup with Roasted Garlic and Ginger, a main of Roasted Pork Tenderloin with Balsamic Glaze and Gingered Peach Salsa and a luscious dessert of Chocolate Cake with Ganache Icing. The G.I. Diet Cookbook will introduce you to a whole new world of sumptuous, healthy eating and a slim new you. The G.I. 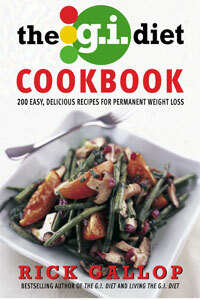 Diet Cookbook can be ordered through www.amazon.ca. 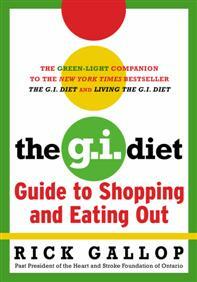 'Living the G.I.Diet' features over 100 new recipes developed by Emily Richards, co-host of Canadian Living Cooks. Living the G.I. Diet can be ordered through www.amazon.ca. The G.I.Diet Shopping and Eating Out Pocket Guide contains the latest complete list of green and yellow light foods to assist you while shopping. It also contains a guide to eating out including the most popular international cuisine such as Italian, Greek, Chinese, Indian. There is also a section on fast food . All this in a compact format that easily fit into your pocket,purse or bag. The Family G.I. Diet has been written in response to the thousands of readers who have emailed us about family issues and the role of The G.I. Diet. It is written mainly through women's eyes in terms of their own health and hormonal issues including pregnancy, nursing and menopause. It also deals from a women's perspective with their traditional role, rightly or wrongly, as gatekeepers for health and nutrition for the family. I have co-authored the book with my wife, Dr Ruth Gallop. Ruth is Professor Emeritus at the University of Toronto with a particular interest in women's emotional health and well-being. For many women a sense of well-being is closely linked to weight and self image. The G.I. Diet is an ideal way for the whole family to eat. In the book we cover finicky tots, junk food obsessed teens, reluctant spouses/partners and ageing parents. So if you're tired of being a short-order cook accommodating everyone's different needs and would like a female perspective, then this is the book for you. End of commercial! Thank You for purchasing The G. I. Diet books, I hope you enjoy them and find them useful!